Simply put, Beyond Organic is a company–launched in November 2011 and led by Founder Jordan Rubin (author of best seller The Maker’s Diet and Founder of Garden of Life)–that arose out of a simple, but oh-so-large, need. Those of us who have joined the company call ourselves Mission Marketers because we share Jordan’s vision and believe we play a role in the mission of transforming our own health and that of this nation. The USDA organic standards have taken our nation’s foods and beverages to a healthier, more educated level, but we believe we’ve got quite a ways further to go. That’s why we’ve gone back in time before shortcuts became the status quo for nutrition. In many cases, that means slowing down dairy culturing, producing smaller artisanal batches of quality cheese, reverting to ancient breeding and biblical processing of cattle, and “taking the heat off” by using low-temperature processing instead of high heat pasteurization. The end result? 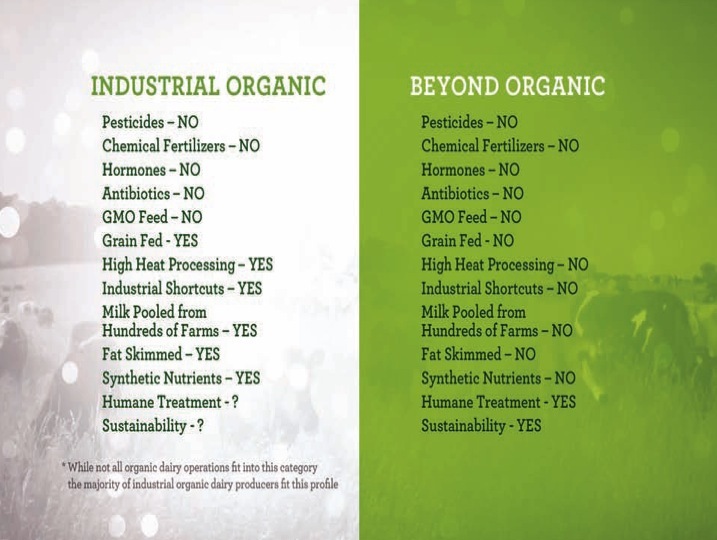 Beyond Organic products boast well-balanced, off-the-chart omega-3s; hundreds of times more fat-burning Conjugated Linoleic Acid (CLA) per serving than that of conventional beef and dairy; at least triple the probiotics of the highest quality dairy available; and concentrated levels of vitamins, minerals, nutrients and essential fatty acids. Rest assured that the nutritional quality of foods and beverages that receive this extra care and attention can VASTLY IMPROVE your health, and you are worth it. Whether we admit it or not, we have a choice in our eating habits: we either pay the farmer now, or the pharmacist later. Wouldn’t you prefer to keep your health in check by enjoying nutritionally superior foods and beverages now rather than risking the unknown affects of genetically modified organisms, hormones and antibiotics, pesticides, and unclean filth associated with much of the conventional beef and dairy available? It’s often said that, “you are what you eat” but it’s also true that you are what they ate. 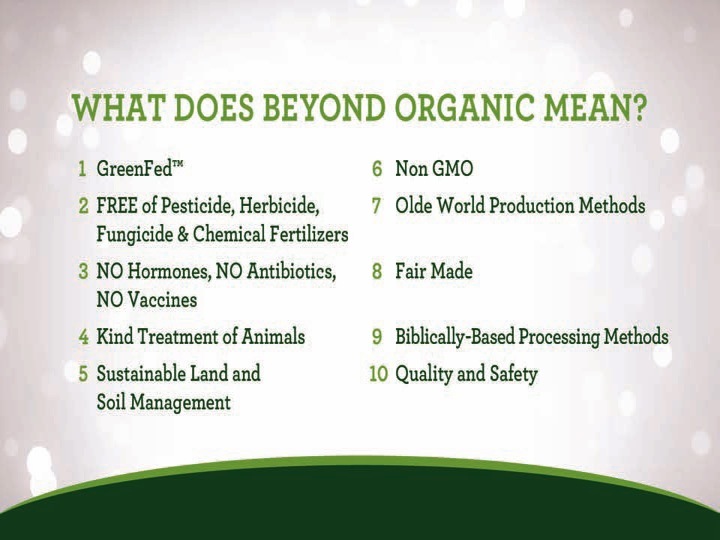 Beyond Organic focuses on exceeding organic standards to ensure no shortcuts are taken where your health is concerned. We’d be delighted to have you join our team to help us spread this important message (and get paid for doing so) or you can become our Preferred Customer and have these products delivered to your door…from our farm to your table.